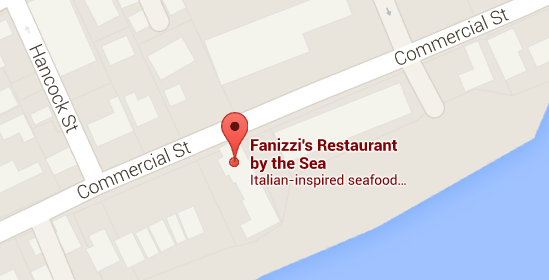 As those who dine with us know, our bay front dining room at Fanizzi’s actually sits OVER the bay during high tide. Water comes fully under our dining room. Some of renovations we had to recently under take were to shore up the pilings that hold our dining room securely over the water. 537-539 Commercial Street, where Fanizzi’s restaurant and parking area sit today, was the location of a fishing empire known as Whorf’s Wharf, built by Thomas Rider Whorf, Jr. in 1850, and later run by his son, Phillip A. Whorf. There was a windmill on the property, presumably part of a saltworks where seawater was pumped to a system of trays and troughs. 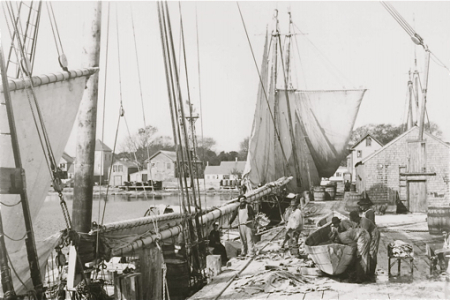 The water was evaporated to produce the salt used in drying and preserving much of the fish caught by Whorf’s fleet. sail loft very likely became Fanizzi’s Restaurant by the Sea, as we know it today. The wharf also had its own sail loft for fabricating and repairing the many sails for its sizable fleet, and Fanizzi’s building is almost certainly that old sail loft, still sitting on pilings at the edge of the beach. The recent repairs, including new pilings installed beneath the restaurant, should ensure many more years of life for this historic building dating back to the height of Provincetown’s great whaling and fishing era, often called the Golden Age of Sail. Be sure to read the entire article at TheYearRounder’s Guide to Provincetown. Join us at Fanizzi’s by the Sea in #Provincetown for lunch and dinner 7 days a week, Sunday #Brunch, Friday Fish Fry, and drinks at our #beachfront bar. Enjoy #waterfront dining on #CapeCodBay!